Armed with a wicked slider and change-up, Jim Konstanty pitched for five teams during his 13-year major league career (1944-1956), while compiling a career record of 66-48, with 74 saves and a 3.46 ERA in 433 games. 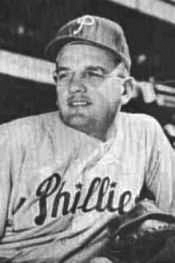 As a relief specialist for the 1950 Philadelphia Phillies “Whiz Kids”, Konstanty appeared in a then-record 74 games, winning 16 and earning 22 saves, as the Phillies captured the 1950 National League pennant. Konstanty added 15 strong World Series innings that year, with a 2.40 ERA against the powerful New York Yankees. For his remarkable efforts in 1950, Konstanty was elected to the NL All-Star team, received the AP Athlete of the Year and The Sporting News Pitcher of the Year Awards, and became the first relief pitcher to win the NL Most Valuable Player Award. To this date, only three other relievers (Rollie Fingers, Willie Hernandez, and Dennis Eckersley) have ever received this honor. It wasn’t until relatively recently that baseball really began to appreciate and fully utilize the relief pitcher. But nearly sixty years ago Jim Konstanty won the National League Most Valuable Player Award as a relief pitcher. The bespectacled right-hander had a long and productive pitching career, but he is best remembered for that amazing 1950 season. Although many great relievers have followed in his footsteps, only three others — Rollie Fingers, Willie Hernandez and Dennis Eckersley —- have ever won the MVP award. Born Casimir James Konstanty in Strykersville, NY, Konstanty was the son of a farmer. He starred in sports in high school and also at Syracuse University, where he earned letters in baseball, basketball, boxing and soccer After graduating from Syracuse he pitched briefly with the Cincinnati Reds in 1944. His attempts at a Naval Commission during World War II were rejected because of his poor eyesight. However, he eventually was able to enter the Navy in 1945. After the war he was discharged, and came back to baseball. Jim signed with the Boston Braves in 1946, and spent three seasons in the minors. In 1948 he was purchased by the Philadelphia Phillies. Philadelphia made the 6’2”, 205-pounder a relief specialist, and “Big Jim” used a slider and change-up with great effectiveness. In 1949 he went 9-5, 3.25 ERA. In 1950 Jim had a remarkable season. He appeared n 74 games (then a major league record), winning 16 games with 22 saves (both NL highs). In that season, he made the NL All-Star team and received the AP Athlete of the Year and the TSN Pitcher of the Year awards. In that season, Konstanty made the NL All-Star team and received the AP Athlete of the Year and The Sporting News Pitcher of the Year awards. Perhaps the greatest indicator of Konstanty’s dominance was that he became the first relief pitcher to win the MVP award. Jim succeeded Jackie Robinson as NL MVP, outdistancing Stan Musial and Eddie Stanky in the 1950 balloting. In a surprise move, manager Eddie Sawyer named Konstanty the starter for Game One of the World Series against the Yankees in Philadelphia’s Shibe Park. Although he hadn’t started a game in 2 years, Konstanty held New York to a single run and four hits over eight innings. However, Yankees’ pitcher Vic Raschi shut out the Phillies as the Yankees prevailed, 1-0. The Phils lost Game 2, 2-1, and the series shifted to Yankee Stadium. The Phillies were leading 2-1 in the eighth inning of Game 3 when the Yankees loaded the bases. Sawyer called for Konstanty, who got Bobby Brown to ground to shortstop Granny Hamner. But Hamner fumbled the ball, and the tying run scored. Konstanty was taken out for a pinch hitter, and New York added another run in the 9th to secure a 3-2 victory. The next day, Konstanty was put into the game to stop a Yankee rally. Pitching in his third game in four days, Jim threw well, though he allowed 3 runs in the 6th inning. The Phils lost the game, 5-2, and the series. Although Philadelphia was swept by the powerful Yankees, the overmatched Phillies performed well. Konstanty had pitched nearly half of the Phillies’ innings in the Series, posting a 2.40 ERA. Jim pitched for the Phillies through 1953, when he was traded to the Yankees. In 1955 he posted a 7-2 record with 11 saves and a 2.32 ERA for the pennant-winning Yanks.The following season he was released and signed with St. Louis, then retired at end of 1956. Konstanty was a scout and coach for the Yankees before leaving the game to run a sporting goods store. For a time he also served as athletic director at Hartwick College in Oneonta, NY. He died of cancer at the age of 59. Jim Konstanty enjoyed a long and productive career, pitching for five major league teams between 1944 and 1956. Used mostly in relief, he pitched 945 innings, had a 66-48 record, and 3.46 ERA. In World Series play he threw 15 innings, was 0-1 with a 2.40 ERA. However, he will forever be remembered in baseball lore for that magical 1950 season. That year he became the first reliever to win the MVP Award, a feat that only three other men have accomplished in the nearly six decades that have followed.